When the pyramid was almost finished, a special block covered in shining metal (either gold or electrum) was placed on the top of the pyramid. 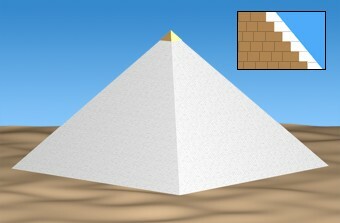 Then, blocks of white limestone from quarries across the Nile were used to cover the pyramid. The blocks were trimmed to make the outside of the pyramid smooth. Finally, the pyramid was finished.